So, today my 12 year quest has begun. I purchased the Complete Peanuts Collection first two volume box-set. I have just begun with the first volume and flipped through the pages of each reading select comics here and there. These collections are simply amazing and the fact that they are coming out with ALL of the strips in the entire 50 year run is a marvel. As a huge fan of the Peanuts, having collected various Snoopy books here and there, this collection is a dream come true. The extras in each book are a very nice addition, as well. So, assuming this forum will still be around in 12 years, I figured I'd start this thread for all 25 volumes of the collection to discuss, laugh and point out our favorite stips. So, I suppose the first question should be: Anybody else collecting these? Yeah, I bought Complete Peanuts 1950-1954 Boxed Set on 11/17 from Amazon for $26.97 with STL. i picked up the first book but due to lack of funds will be holding off on the rest until i get a job. I have the first two sets. They're cool. I started buying when they were first released so missed out on the benefit of the discounted boxed set of the first two volumes. The books are great and I hope they do well enough to justify continued publication through the end. I recall reading Peanuts compilation books in my childhood. I loved it then and still do today. I bought the first edition and missed out on the boxed set as well. But I plan on sticking through the series as long as they put them out, even though it's the 50's strips that I'm really excited about. My favorite strip so far is in volume 1 on the bottom of page 17. I'm thinking of having that one blown up to hang on my wall. Maybe it will inspire my wife (you'd understand if you saw the size of my comicbook collection). I've been getting them too, this is the kind of dream project I used to think about back in my geek youth when I realize to my shock that the cheap Peanuts paperbacks I liked were NOT reprinting every single strip! (The horror!) I'm just really impressed at the high quality Fantagraphics has brought to the table with this and have gotten a kick out of all the weird early strips that I'd never seen before. (Charlotte Braun? Who knew?) Have to admit, I'm really psyched for another volume or two down the road as the strip enters its late 50s -1960s heyday, when it really was the best comic strip on the planet. Don't know if I'm going to get EVERY volume (even if the completist in me whines to do so); 12 years is a long time and at $30 a pop, that's a lot of change, and I have to admit by the mid-80s the strip started to get pretty stagnant. But I'm definitely collecting at least to the 1970s. Awesome project through and through. I thought it was amazing how Fantagraphics and Seth managed to find such clean strips but, most of all, a Sunday strip in Vol. 2 they found was not usuable (at least the top portion). They faithfully recreated it so fans can have what they call the Grail of Peanuts strips for collectors. At the back of the volume they list this and write that if they find it over the course of the publications of further volumes they will include it in one of the new volumes so fans do not have to repurchase the Vol. 2. Very classy. The third volume in our acclaimed series takes us into the mid-1950s as Linus learns to talk, Snoopy begins to explore his eccentricities (including his hilarious first series of impressions), Lucy's unrequited crush on Schroeder takes final shape, and Charlie Brown becomes...well, even more Charlie Brown-ish! Over half of the strips in this volume have never been printed since their original appearance in newspapers a half-century ago! Even the most dedicated Peanuts collector/fan is sure to find many new treasures. The Complete Peanuts will run 25 volumes, collecting two years chronologically at a rate of two a year for twelve years. Each volume is designed by the award-winning cartoonist Seth (It's a Good Life If You Don't Weaken) and features impeccable production values; every single strip from Charles M. Schulz's 50-year American classic is reproduced better than ever before. 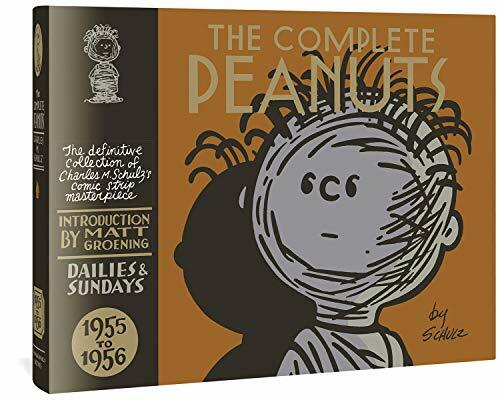 This volume includes an introduction by Matt Groening (The Simpsons) as well as the popular Complete Peanuts index, a hit with librarians and collectors alike, and an epilogue by series editor Gary Groth. Floors me each time I see it! I wonder if there's a way for those of us who bought the individual first and second volume to get the collector box on its own. It certainly isn't anything to crow about. I had originally been holding out those extra months thinking the box-set would have extra matrial in it or artwork but, alas, it is only the box. I mean, it is nice to have an extra casing to house the books in and I am sure they will be doing the same for each year but, really, not worth going out of your way for, IMO. It doesn't really matter to me that I didn't get a box. I plan to have a whole row of these suckers on the shelf. Having the first two volumes in a box would just look silly. Fantagraphics is great. In Little Nemo In Slumberland, they also printed, in later volumes, improved versions of the weaker pages. Last edited by Nick Danger; 12-14-04 at 12:45 PM. I plan to do the same thing, but if these things come out in two-book box sets at the end of every year, that would look cool on the shelf, too. I have a feeling this isn't a one-time thing. You can get the slipcase from the publisher if you really want it. Click here and search on "PEANUTS SLIPCASE". Just don't see a need for slipcases myself, I'll just line the books up on the shelf. The only reason I am purchasing the 2-book box sets is because it is a touch cheaper to do so, although not by THAT much, and I can wait for it at the end of each year. The box, though, can be turned around to display the spines of all the books if that is your main reason for not snagging one. I picked up 1950-1952 last July. Thanks to some luck and good timing, it turned into a special treat for me. I was out roaming the main floor at San Diego Comic-Con. I was passing the Fantagraphics booth and sitting amidst a stack of the first book was Jeannie Schultz. Holy moley, I didn't know she was supposed to be in the main room! She was speaking with someone so I grabbed a book and patiently waited my turn. Because no one else was behind me, I was able have a nice conversation with her. What a genuinely warm person she is. Her eyes lit up when she spoke about "Sparky". I asked her about the early years but she reminded me that they married in 1974 (or was it '73) so she couldn't really comment. Ooops! So, to answer the OP.... yes, I'm collecting them. Great post. I certainly envy you as it sounds like a great experience. Thanks for the heads up on this. Being a child of the 70's I never got to really enjoy the Peanuts strips from the 50's & 60's. I did however enjoy the strip during my youth. I just may start picking this up. Is there a tentative release schedule for these? I am now definitly going to get the Vol. 1 & 2 set. It appears as though the sets are released in April and October with the box set of both also released in October. Unsure if that will hold up over the course of the next 11 years but it seems about right to me. 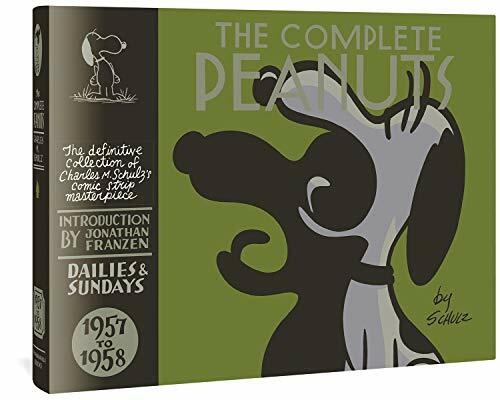 The Complete Peanuts 1955-1956 has been released and, thus far, has become my favorite volume of the three currently released. It just seems like everything is easing itself into common Peanuts strips with Charlie Brown less the prankster and more the wishy-washy round headed kid we've come to know. Luch is more fussy and Linus begins to speak. And much more for all you Pig-pen fans. Another great collection! No news on who is providing the intro to the next volume or if it will be available in a box set. It is expected to be released in November and has Snoopy on the cover. So, according to the Fantagraphics comics board (and now at AMAZON) there will be a box set for this release with another box designed by Seth to house this years two collections. However, the board also made note that this will probably be the last box set. They are cutting it out due to production costs for the series. It'll be hard, but I think I'll wait for box set #2. I'll put it on my Christmas wish list. Still waiting for my Volume 3.